Australian Hiker | How much gas is left in your canister? How much gas is left in your canister? One of the biggest worries newer hikers, or for that matter experienced hikers have, is ‘Do I have enough stove fuel for my planned hike?’ This is a question regardless of the type of fuel you use but with liquid fuel it’s usually easier to gauge – you can physically see the amount of fuel you have left. This is not the case with gas canisters because a gas cylinder is enclosed and looks identical, new or used. But somehow you need to determine the remaining lifespan to ensure you can cook up that great dish when you’re hungry! There are two methods hikers use to gauge the remaining fuel level in a gas canister and providing you know your average daily usage, you will be able to select the best canister for your upcoming adventure. You’ll never have to again carry extra canisters just in case or worry about running short. 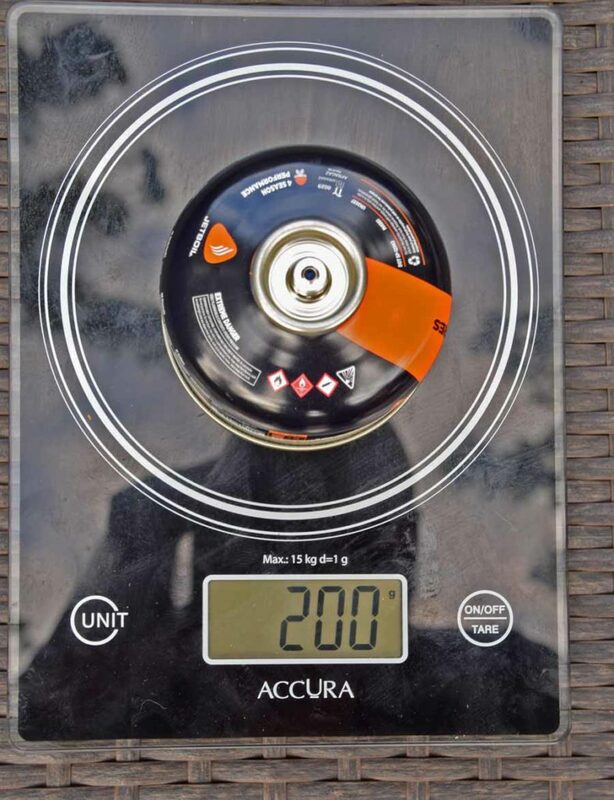 By far the most accurate way of gauging the amount of gas in a cylinder is by using a set of digital scales. My preferred gas canister size is the 100 gram canister which conveniently enough weights 200 grams when full (without the small plastic cap). This means an empty canister will weigh 100 grams because the canister size of 100 grams refers to the amount of available gas. 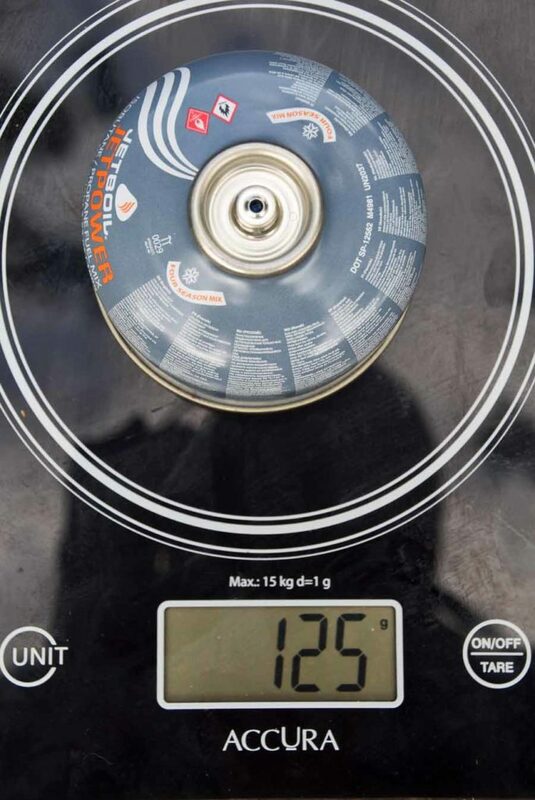 Simply by weighing the canister before you head out for a trip, you will know how much gas is still in the cylinder. This method is applicable to all canister sizes. 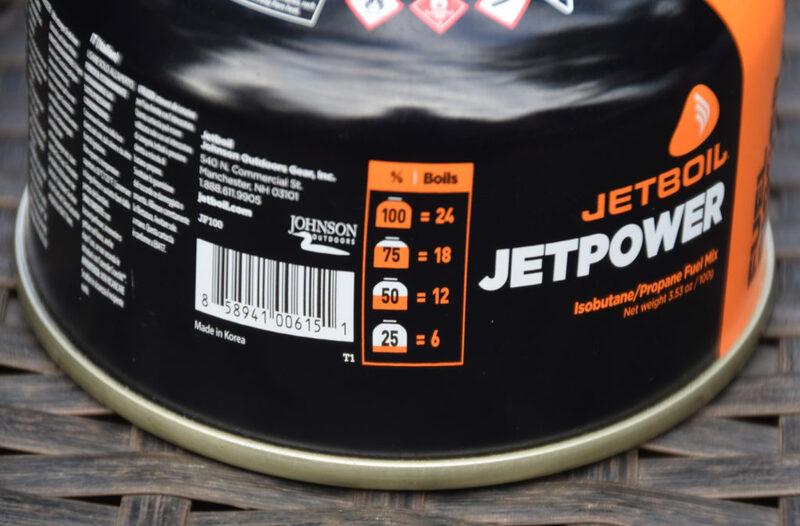 You just need to weigh a full canister, and based on the canister size work out how much the gas versus the canister weighs. Another option you can use is to ‘float’ your cylinder in a container filled with water and see how high it floats. A full 100 gram canister will sit low in the water with the level being around the top of the straight side. The more gas you have used out of a canister, the higher the canister will float. 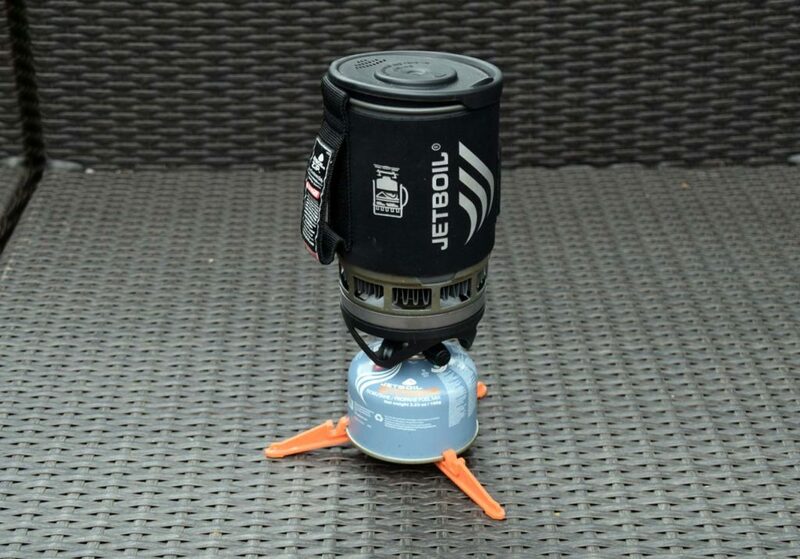 The newer Jetboil gas canisters have a small pictorial gauge on the side of the canister and the water level will be roughly in line with the little indicators on the side. This allows you to more easily estimate what is available to use although it is important to note that the canisters rarely sit straight. This method is no where near as accurate as weighing the canister but it does provide a rough indication of available gas. 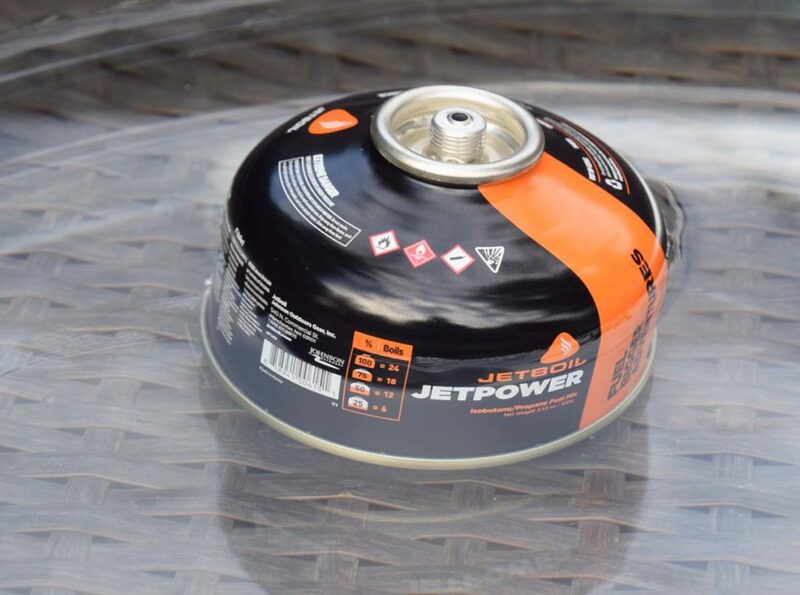 If you use a gas canister for cooking, in the majority of cases you are either using an integrated stove such as the JetBoil or MSR brands, or you are using a screw in stove unit that attaches directly to the canister and then you add a pot or saucepan of some type. 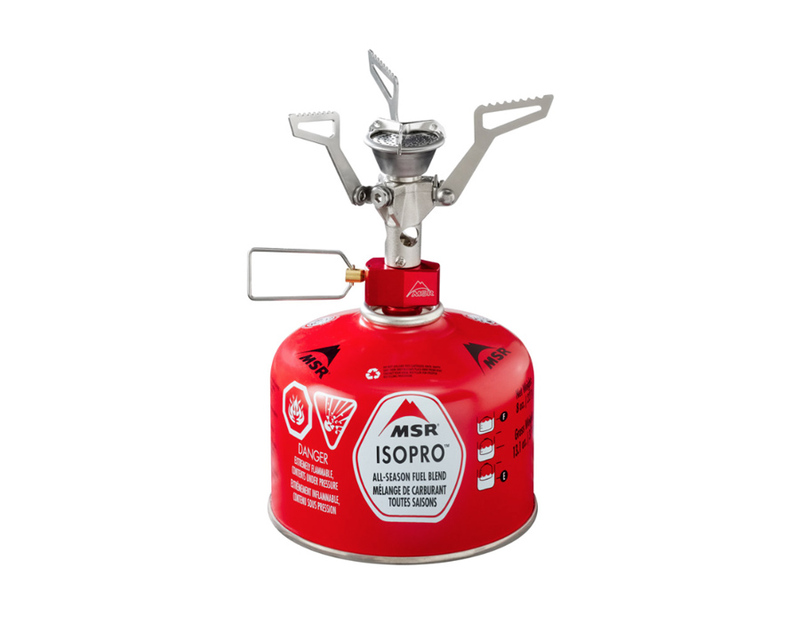 While the integrated stoves are popular from personal observation, the majority of people I have come across prefer to use the small stove units that screw into the top of the gas cylinders. Because stove types vary, weather conditions can impact gas consumption (e.g. windy conditions will blow the flames around so the stove will be less efficient), and every hiker uses their stove differently, the only way you will be able to work out your personal gas consumption is by keeping track of your usage over time. I don’t cook when I’m hiking preferring instead to just boil water for both hot drinks and to rehydrate a freeze dried meal. 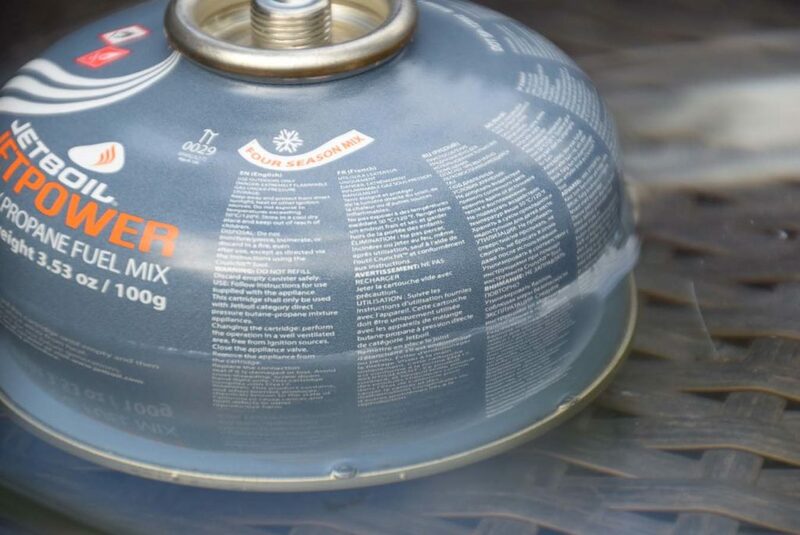 While I own six different stove sets, my go to stoves are usually the integrated gas canister stoves with the model depending on whether I’m hiking solo or as a couple. Which stove to use for hiking is entirely up to you. Over the past three years I have paid careful attention to our gas use and it turns out to be pretty consistent regardless of the time of the year or type of hike we are doing. I boil water for a hot drink in the morning, a hot drink in the evening, and around 350 ml of water for a rehydrated freeze dried meal (as a solo hiker). This means a 100 gram canister will usually burn for around one hour and based on my usage will comfortably last me 12 days (8 grams per day) when solo hiking. When there’s two of us hiking, we work on 7-8 days per canister given the increase in the amount of water we are boiling. Every hiker is unique in they way they use their stoves on the trail. Some people cook and some people rehydrate. The choice is very much a personal one and with it the amount of gas you use. By far the best option for estimating available gas usage is to weigh your gas canisters prior to heading out on a hike. 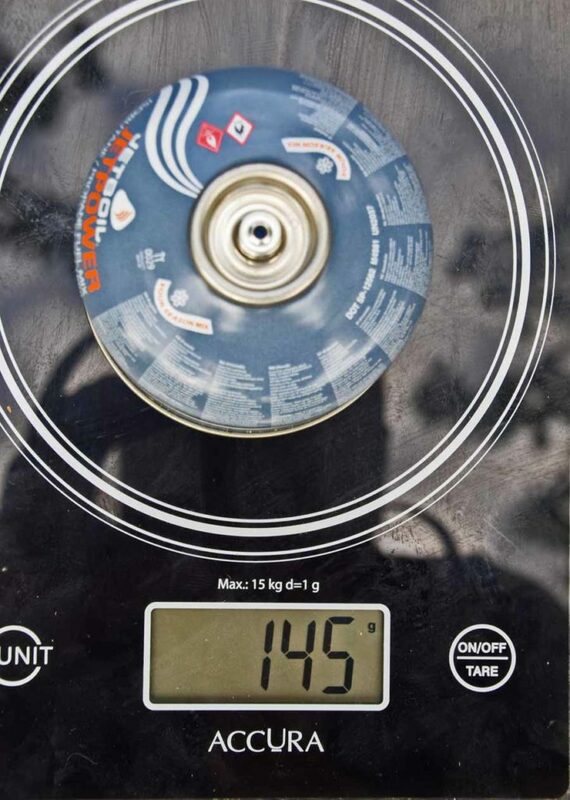 The float method will provide a rough indication if you don’t have a set of scales but isn’t particularly accurate if the canister is almost empty. These days small digital kitchen scales are relatively inexpensive so if you haven’t already done so, do yourself a favour and buy a set for home to get an accurate indication on how much gas you are actually using. This is a small price to pay for that piece of mind on the trail.